Sharp announced it will show two new oxide-TFT (IGZO) based OLED panel prototypes at SID 2012 next week. The first panel is a 13.5" 3840x2160 (QFHD) panel.The panel features 326 ppi and is made using a WOLED (RGBW) architecture - similar to LG's upcoming OLED TVs. 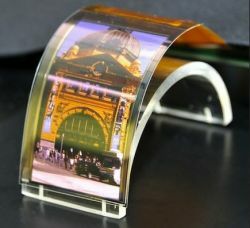 The second panel is a flexible OLED, 3.4" in size. It too features 326 ppi (540x960 resolution). We do not have more technical details, hopefully we'll learn more at SID. Back in January, Sharp's president said that the company has no plans to enter the OLED market, but obviously they are interested in the technology - enough to make these very promising prototypes. We do not know of any commercialization plans for these panels yet.